Participants will learn about atomic force microscopy (AFM) and about introductory polymer physics. We will cover the basic operating principles of AFM that are necessary for running the experiment, including force curves, laser deflection, tip geometry, scanning modes, and resolution limits. In addition, we will discuss the polymer physics used to analyze our DNA samples. We will start out by discussing the random walk of a DNA molecule and then quickly transition to models of DNA as either a freely jointed chain or a worm like chain. During these discussions we will talk about the physical properties of contour length, persistence length, drag, and stretching forces, which will be the properties we will measure in the experiment. The goal will be to give participants the full picture of the biophysics behind the experiment so that they can devise future experiments. For a more in depth look at the experiments, participants can download our manuscript (Devenica et al., AJP, accepted) from the arxiv. The AFM we will be using is a portable instrument from Nanomagnetics (ezAFM model shown above) that is user friendly and affordable. However, the principles we will learn will be general to all AFMs for an easy transition to other instruments. 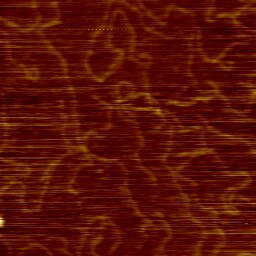 Here is an image of many molecules of double-stranded DNA (length = 1 µm) taken with the ezAFM. The width of the image is 1 µm. Place of Experiment in Curriculum: This experiment would be ideally suited to laboratories in modern physics, biophysics, statistical mechanics, or advanced topics. The laboratory covers techniques in atomic force microscopy and single molecule biophysics, which are techniques that are ubiquitous in graduate labs and industry. In addition, the laboratory allows for easy measurements of some fundamental polymer properties. Finally, the laboratory lends itself to a variety of formats. Imaging DNA with an AFM and measuring some physical parameters could be easily done in a 3 hour laboratory, while more intricate student-designed projects could be done overall several weeks. Skills Attained: Participants will learn about the basic operation of an AFM and how to collect data so that they will be able to repeat the experiment on their own local AFM. Single molecule biology techniques, including pipetting, making reagents, and adhering biological molecules to surfaces will also be taught. Immersion Timeline: There will be two phases of the immersion. During the learning phase (1st day) we will follow the basic system of see one, do one, teach one. First, we will talk about DNA and its polymer properties and show everyone how to make a DNA sample. After seeing how to pipette and how to adhere the DNA to the surface, participants will make their own DNA sample, before teaching some of the students in my lab how to do it. Second, we will discuss the physics of AFM and show how to image the DNA sample with the AFM. Once everyone has seen how to work the instrument, participants will be asked to change the AFM tip, autotune the tip for tapping mode, move to a particular location of the sample, and change the scan settings to take a particular image. 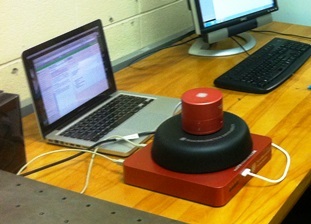 Again participants will get the opportunity to explain how to use the AFM to the students in my lab. Finally, at the end of the learning phase we will analyze the images to pull out particular physical parameters of interest such as contour length, persistence length, and the drag force. During the second phase, the exploratory phase (2nd and 3rd day), we will show you how to make several DNA samples and how to change the AFM settings on your instrument to get the best images. In this phase, we can begin to tailor the experiment to your specific needs. Samples are fairly inert and do not require a fume hood or any special consideration. Gloves may be worn to protect samples from hands. Cost of the Experiment: ∼$100 for the materials. $8-60K for an AFM. Typically, large universities have user facilities with AFMs. So there is a good chance you might be able to gain access to a local AFM.